Honda Motorcycle and Scooter India Pvt. Ltd. announced the culmination of its mega National Road Safety Week drive. 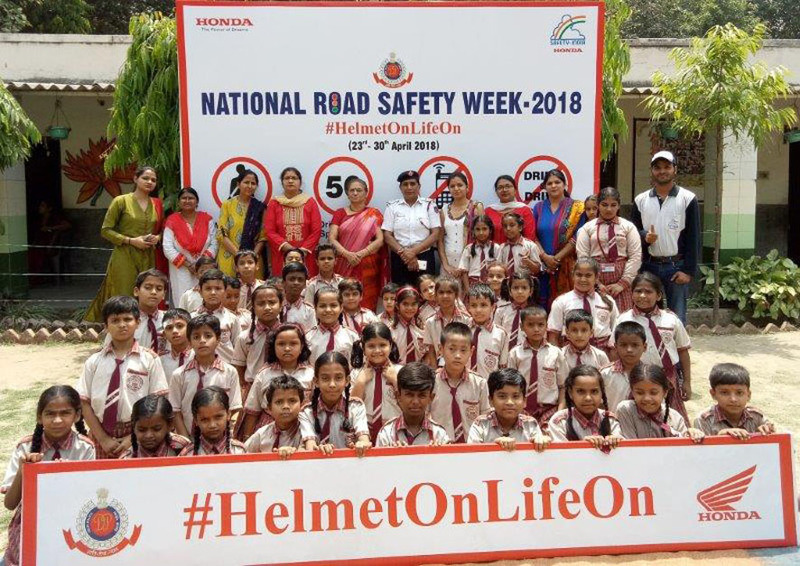 Spreading the #HelmetOnLifeOn initiative across India, Honda educated over 70,000 people on the importance of wearing a helmet while riding a two-wheeler. Working in collaboration with SIAM-SAFE (Society of Indian Automobile Manufacturers-Society of Automotive Fitness and Environment) Honda engaged with people across all age groups. Honda’s specially trained road safety instructors at 12 traffic training parks, and efforts of its vast 5,700+ touchpoints reached out to thousands of road users during this week with #HelmetOnLifeOn initiative. Activities like riding trainer stimulator sessions, safety quiz and safety pledge were conducted in collaboration with schools, colleges as well as corporates. A specially designed training module on importance of helmets and other aspects of road usage was delivered across Honda’s 12 traffic training parks. Individuals were also educated on the importance of safe braking, maintaining correct posture while riding. New riders were educated on the need of wearing appropriate riding gear. * Customized road safety modules for children: Kids in the age group of 9-12 years experienced the joy of riding a motorcycle in a safe and restricted environment while understanding the importance of wearing appropriate riding gear on specially imported CRF50 motorcycles. Acting as a check on parents, kids inculcate safe riding habits back at home. Cycling and primary activities (road safety quiz, road safety pledge) kept the fun factor alive for teenagers. * Dream Riding for females: Women above the age of 18 learnt how to ride an automatic scooter in just 4 hours at their convenience. The dedicated task force of skilled women safety instructors first undertook a theory class followed by a session on Honda’s proprietary 2Wheeler Riding Trainer. Summing up the teaching was a practical session in the practice track of traffic training parks. * For new & existing riders: Participants of 16 years and above in age got to experience over 100 possible road dangers on Honda’s proprietary two-wheeler Riding Trainer. The compact, state of the art Riding Trainer offered a safe way to experience hazardous situations. It also gave beginners a chance to practice the use of clutch and other motorcycle operations before riding an actual motorcycle. For Honda 2Wheelers India, road safety comes first. In its 17 years’ journey in India, Honda has empowered more than 18 lac individuals on road safety. Adding more people every day, be it working professionals, college-goers, home-makers or senior citizens, Indians are realizing their dream of becoming an independent and safe rider via Honda safety riding and training programmes. 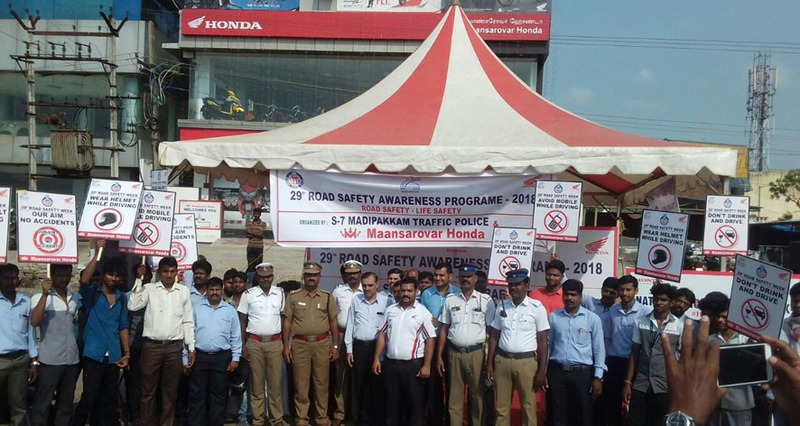 In 2018, Honda was felicitated by Government of Odisha for promotion on Road Safety Training and Awareness. Leading the cause, Honda has adopted 12 traffic parks in Delhi (2), Jaipur, Chandigarh, Bhubaneswar, Cuttack, Yeola (Nashik), Hyderabad, Indore, Ludhiana, Coimbatore and Karnal.